We already talked about why power washing your house before selling it is so important. However, if you want to prevent permanent staining caused by mold, mildew, algae and other airborne contaminants at the place where you want to feel safe and cozy after a long day of work, then that is BIG reason to power wash. But, what areas of your house should you power wash and why? You might think power washing a deck is as simple and fast as drinking a good beer on a hot day. Let me tell you, my friend, you’re wrong. If you don’t have the right equipment and experience you can easily damage your deck. Professional power washers know how to operate the right machine and the perfect pressure setting to leave your dirty and old looking deck feeling fresh and new! Every time you have visitors on a beautiful summer day, the best place to chill and relax with your peeps is your deck. Let’s be honest, who wants to BBQ on a dirty and moldy deck. Maybe if you’re a guy, you might think “who cares!” (not saying that all guys think like that btw). But, it’s just so nice to hang out on a deck that feels fresh and clean. * Improves its durability 💪🏼. * Protects your investment 💵. * Significantly helps to increase the value of your home 🏡💰. Concrete driveways and walkways don’t escape from mold, oil, grease, mildew, dirt, black and green algae… Any way you look at it, with time they lose their light appearance and start getting that gross black or green colour from our loving friends that I mentioned before (sarcasm). Also having a dirty driveway and walkway can easily cause accidents or injuries from walking on slippery ground. Believe me, you don’t want that to happen on your property. In some States, there are laws that fine people for not taking care of their sidewalks. There are some chemical cleaners that people use to remove the dirt from their concrete but they also can cause permanent damage. 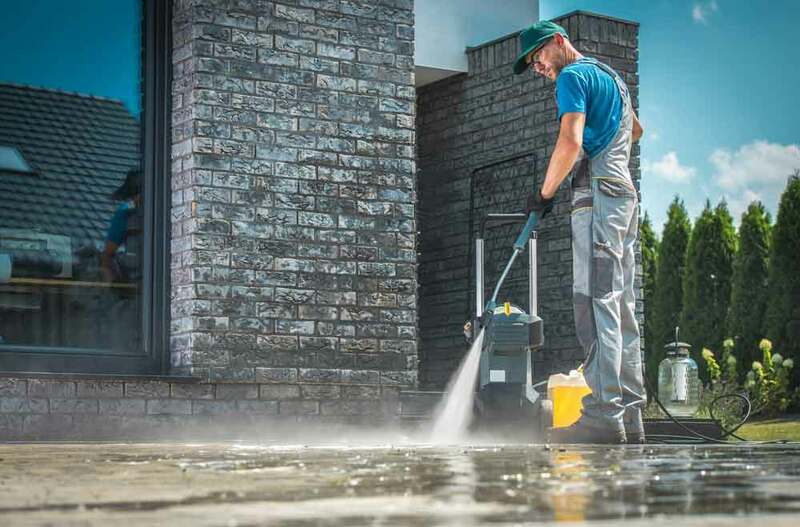 Power washing your concrete is an effective way to get rid of all that grime. It also will bring back that beautiful white colour that it had when they were brand new. If you leave that awful looking grime on your concrete, with time it will cause holes and cracks that can cost thousands of dollars to repair… 💰😧. The siding of your house is very important to maintain. It’s a defense shield that protects your house from the elements that attack it like the sun, snow/rain, cold/heat, etc. Making the interior safe and cozy. Usually, humid seasons cause mildew, mold and algae growth. There are a wide variety of materials used for siding. Let’s talk about some of them that need to be power washed. Vinyl and fiberglass: Should be cleaned at least one time every year for maintenance, but, if you live on a busy road or an open and dirty field try to get it cleaned more often. They can handle pressure washing without getting damaged. Wood clapboard: There are so many house owners that assume they need to replace their wood siding because it gets black and discoloured. But to do a whole replacement of wood siding would be extremely expensive and remember it will get dark and discoloured again over time. It’s normal. I have good news for you! You can just power wash it. It will bring your black and discoloured wood back to a new looking condition. * A satisfying brand new look again 😍. * Removes all contaminants, keeping your family safe 💪🏼. * Will bring value to it 💸. Your garage is the place where you store pretty much everything that you can’t have inside your house, including keeping your vehicle safe from the elements. But, your garage also stores all kinds of dirt. From leaves, bugs, and dust that the wind blows inside, gross dirt that your tires bring home from everywhere, to all kinds of products that fall on the floor. And we can’t forget stains caused by oil, grease, rust, etc. Picturing all of that, the result is a very nasty floor 🤢. Here is where our professionals’ power washers come on the scene. Water pressure can wash away all that grime and restore your garage floor to a perfect condition. So you know, it’s not easy peasy as you think to get this result. It requires a lot of preparation.